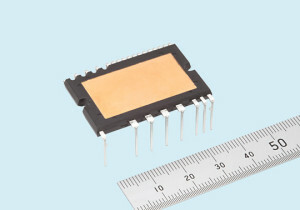 Mitsubishi Electric Corporation announced today the immediate launch of a transfer-molded super-mini dual in-line package power factor correction (DIPPFCTM) module incorporating silicon carbide (SiC) transistors and diodes, which is expected to help reduce the power consumption and size of home appliances. Mitsubishi Electric’s new DIPPFC module will be exhibited at MOTORTECH JAPAN 2014 during TECHNO-FRONTIER 2014, which will be held at Tokyo Big Sight in Japan from July 23 to 25. Power loss is reduced by about 45% compared to silicon (Si) products, contributing to improved energy conversion. SiC schottky-barrier diode (SBD) reduces recovery current power consumption and electromagnetic interference noise. SiC metal oxide semiconductor field effect transistor (MOSFET) achieves maximum 40kHz high-frequency switching and contributes to downsizing of peripheral components, such as reactors and heat sinks. Power factor correction (PFC) and driving IC contribute to downsizing by reducing mounting surface area and simplifying wiring. Adoption of the same package as the dual in-line package intelligent power module (DIPIPMTM) simplifies the installation of heat sinks. Interleave method for PFC decreases the ripple current and simplifies the noise filter circuit.